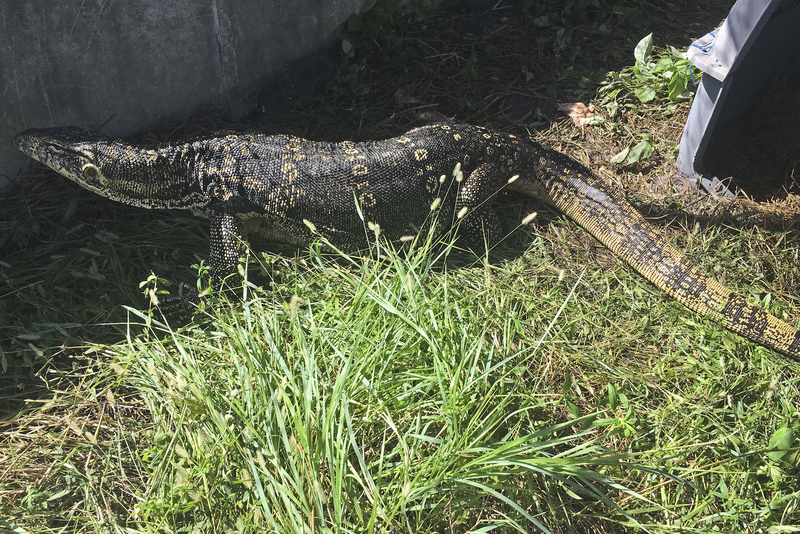 A huge lizard that has terrified residents of a suburban neighbourhood in Florida for months has been captured, authorities said. The Asian water monitor lizard measures more than 8ft (2.5 metres) long, the Florida Fish and Wildlife Conservation Commission said. The lizard, which is an escaped pet, was first reported loose in August in a neighbourhood in Miami. Residents in Davie said it lurked in their back gardens and scratched at their patio doors. Wildlife officers and local police officers caught it after getting a tip from a resident who said the lizard frequently appeared on his property around midday. Owners must have cages to keep such lizards as pets. It is illegal to release non-native species in Florida.